The thing I love so much about this shopping street in Harajuku (Takeshita St) is that it sits right next to the Harajuku train station. On the other side of the station is a massive temple (Meiji Jingu), which is generally quiet and peaceful. There are people around, but it's so massive, and there's so much greenery around, that it feels completely relaxed. 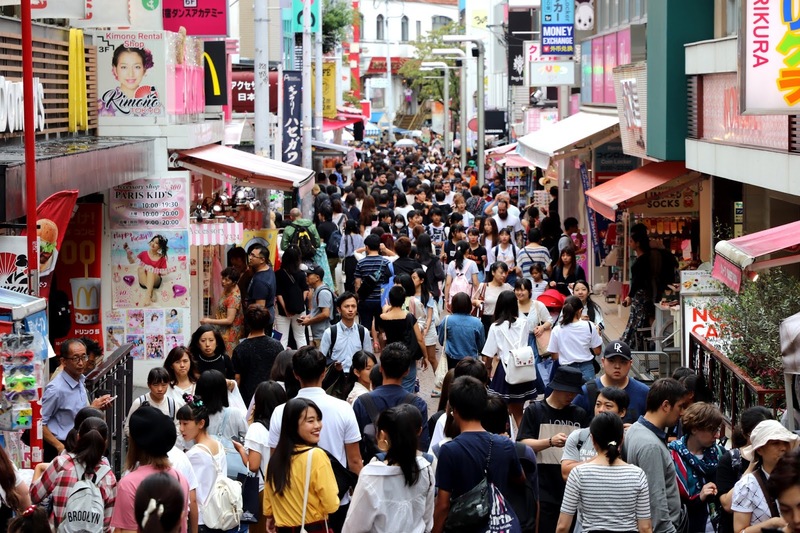 So you can get to polar opposite sides of the coin at once in a single trip to Harajuku. So good. On the day that I took this photo, I had an amusing experience in one of the candy stores down the street - Harajuku is a paradise for people with a sweet tooth. The shopping overall isn't great, but the crepe, fairy floss and candy stores are everywhere. Anyhow, there is a candy shop down that street that specialised in sweets from all over the world, and it sold liquorice as a joke, with a label to the effect of "give this disgusting crap to your friends as a dare. No one will be able to eat it"
It was plain, normal liquorice. It's the only place in Japan I've ever found that sold the stuff, because the Japanese do genuinely have a cultural hatred towards the flavour. But I love liquorice, so I bought a bag full and the sales girl looked at me weirdly. I bet she was thinking "stupid gaijin." It's my favourite Harajuku story.